This summer, Maya K'iche midwife trainer Verónica Mazariegos, along with Kaqchikel traditional midwife and women's activist Antonia Buch, visited Ontario for a knowledge exchange under the Maternal, Newborn, and Child Health (MNCH) project, which is financially supported by the Government of Canada. This particular exchange focused on connecting Mayan peoples with Indigenous communities in Ontario. (From left to right) G’MIWON OTCHITCHAKONS aka Raymond Jackson, Antonia Buch, Diana Castaneda, and Verónica Mazariegos standing side-by-side in Manitoulin Island. The exchange kicked off with Horizons of Friendship's (Horizons) Annual General Meeting (AGM). Every year, Horizons celebrates its founders through the Founder's Award, an award dedicated to acknowledging Canadians for their volunteer work. Additionally, the Founder's Award recognizes one of Horizons' local partners in Central America and Mexico. 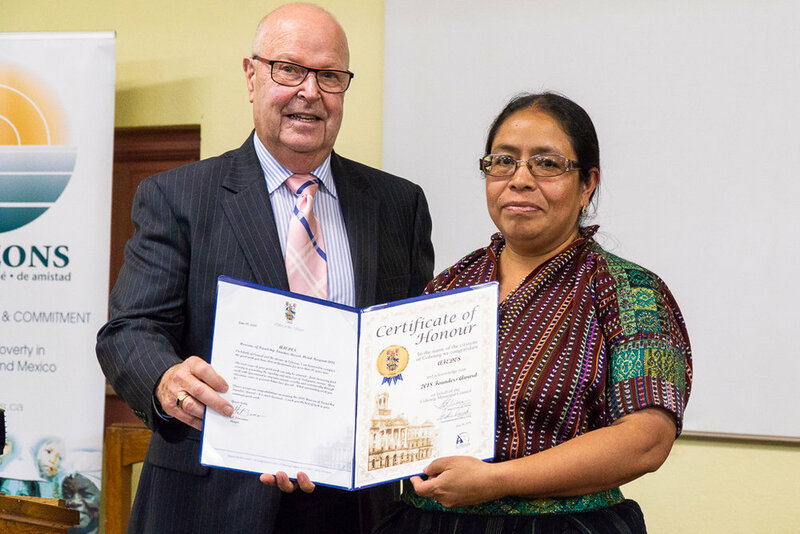 This year's recipients include former Cobourg lawyer and retired judge James Clarke, and the Women’s Association for the Development of Sacatepéquez (AFEDES) from Guatemala. Horizons board member Garnet Ward (left) presenting the Founder's Award to James Clarke. Antonia accepted the Founder's Award and Certificate of Honour from Cobourg Mayor Gil Brocanier on behalf of AFEDES. The exchange continued with a visit to the Markham Stouffville Hospital, where Antonia and Veronica were greeted by a large crowd of health professionals comprising midwives, nurses, doctors, and hospital administrators. Veronica spoke about the role of a comadrona (a traditional Indigenous Maya midwife) in the predominantly Maya department of Totonicapán, Guatemala. Antonia then spoke to the challenges facing the health system in Guatemala, and how the MNCH project is making an impact in Totonicapán's rural, Maya communities through its many strategies - one of which includes bolstering the Guatemalan Ministry of Health's comadrona training program in Totonicapán and supporting calls for increased recognition of comadronas' efforts. Dr. Robert Hall, a recent Canada-to-Guatemala knowledge exchange participant with Horizons, assisted in organizing the event at Markham Stouffville Hospital. Markham Stouffville Hospital health professionals were captivated by the Guatemalan duo's presentation. At the end of the presentation, all Markham Stouffville Hospital midwives gathered for a group photo with Antonia and Veronica. Following an intimate session involving Indigenous and non-Indigenous attendees at the Native Canadian Centre of Toronto with a focus on the traditional practices of comadronas, the group moved up to Manitoulin Island to attend the second biennial Indigenous Conference organized by the Ontario Public Service Employees Union (OPSEU) in conjunction with Elders and community members of the Wikwimekong Unceded First Nation. Antonia and Veronica were invited to lead a workshop covering the experiences, practices and struggles of comadronas, and how the MNCH project is strengthening their efforts to the benefit of thousands of Indigenous Maya K'iche' women and children. The sun set as the group arrived to Manitoulin Island. Antonia, being a spiritual guide as well as a traditional midwife and activist, opened the workshop with a traditional Maya prayer. She thanked the Creator and asked for justice to prevail in all communities in the North and the South. Seven participants were invited to directly help during the prayer, which Antonia conducted in her first language - Kaqchikel. Antonia prepares the opening prayer with the support of OPSEU's Indigenous and non-Indigenous members as well as Wikwimekong Elders. OPSEU members alongside Wikwimekong Elders and community leaders listened closely to Antonia's prayer. Workshop participants were asked to hold candles as part of the Maya prayer. After the prayer, the workshop began. Verónica, having facilitated culturally pertinent training for comadronas in the Mam and K'iche' areas of Guatemala's Western Highlands alongside Horizons' partner PIES for over 17 years, explained the multifaceted role a comadrona fulfills - not only providing holistic care in accordance with the Maya worldview and culture, but also being an invaluable front-line worker delivering births and caring for mothers and their newborns. Verónica reviewed the many responsibilities a comadrona carries out, in keeping with Maya culture and current realities in rural communities of the Western Highlands. Despite their contributions, comadronas still face numerous barriers, including the need for greater official recognition of their work. Antonia thus recounted her own personal efforts in advocating for the rights of comadronas, describing these efforts as essential to the struggle for the rights of all Indigenous Maya peoples. Both women concluded by sharing testimonials on how the MNCH initiative is helping overcome those barriers by facilitating culturally pertinent training and equipment, improved coordination with the Guatemalan Ministry of Health, and support to increase the recognition of comadronas. During the conference, Verónica and Antonia also learned of the immense resilience of Indigenous peoples in Canada who strive to revitalize their language, culture and communities in the face of colonialism and its enduring legacy. In addition to sharing their experiences, both women formed part of ceremonies, dialogues and sessions led by Wikwimekong Elders and OPSEU Indigenous members that honoured and recognized that revitalization. Verónica and Antonia thanked Conference participants for their solidarity. "This was a special encounter," said Antonia. "We learned that Indigenous peoples in Canada and Guatemala continue to face similar challenges. We trust our participation in this exchange helped build solidarity between Indigenous peoples in the North and South," she added. "This was a completely new experience that opened my eyes," said Verónica. "Seeing firsthand the resilience with which Indigenous communities in Canada are working to reclaim their culture makes me all the more committed to helping improve the health of Indigenous Maya women and children back home," she added. Antonia (left), and Veronica (right), flanking Anishinaabe kwe, Michipicoten First Nation (Robin Superior Treaty), and proud OPSEU member, Lise Dampier.